You should be able to get to grips with basic chords in a very short space of time. 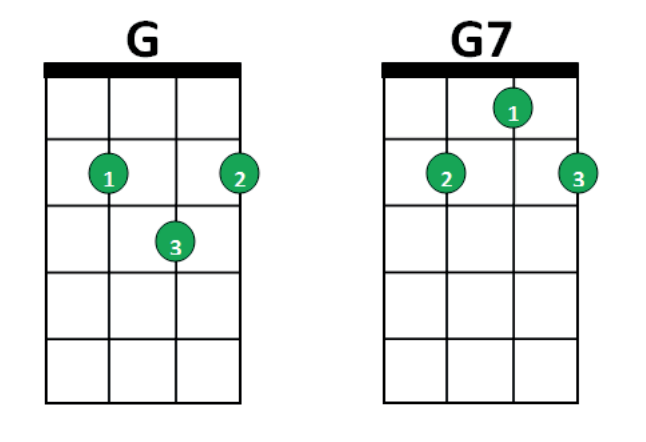 Once you have got C, F and G sorted, you can play a whole host of two- and three-chord songs. C is the best chord to start off with: It doesn’t really matter what finger you use to fret a C chord, although most people use their ring finger, as this gives greatest flexibility for moving to and from other chords. Make sure you are stopping the string cleanly and just behind the fret (i.e. 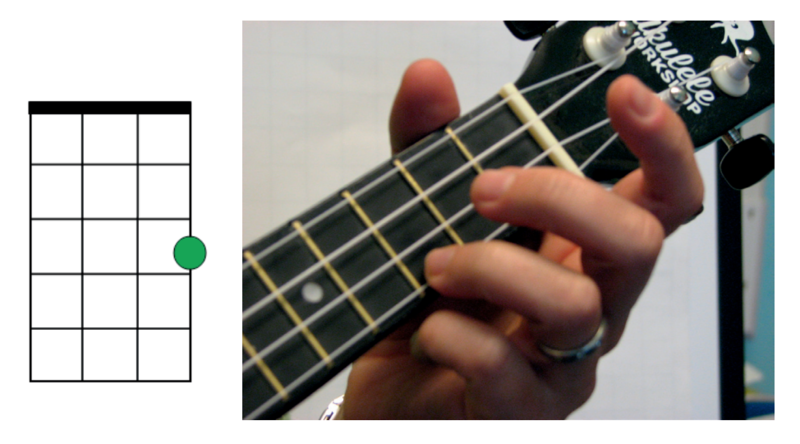 towards the pegs), and check that your left thumb is curved around the neck of the ukulele, not supporting the neck from the back. You can strum a ukulele in any number of ways, but the easiest and cleanest way is with your index finger. Point at yourself (as though you were singing ‘Me, a name I call myself’) and then reinforce your index finger by laying your thumb across it. Then use the nail of your forefinger for the down-strum, and the pad for the up-strum, making sure you are hitting the strings roughly where the neck meets the body of the instrument, and not over the sound hole. This method is the least likely to result in blisters. To start off with, get used to a basic up-down-up-down strum, making sure you make contact with all four strings, and that the rhythm is even. Once you have got this far, you can begin to practise playing and singing at the same time straight away: it is a good idea to make singing and strumming natural companions right from the start. 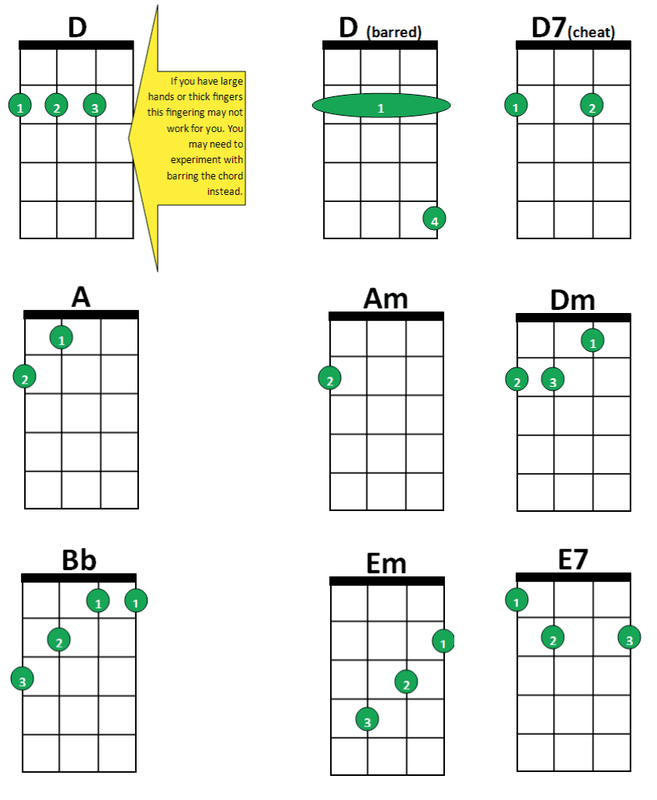 F is the next chord to learn: When teaching students to read chord diagrams, you will need to point out which lines are the frets, and which are the strings, as there may be some confusion at first. 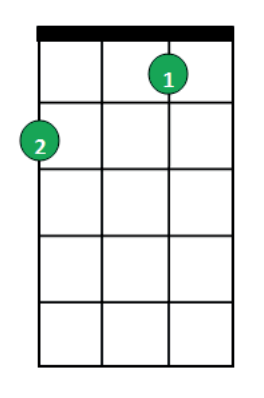 Some teachers put coloured dots on the fretboard: yellow for C, two green for F, red for the other two needed for G.
Most Songs use only a 3 or 4 chord pattern. Write your own pattern. Experiment with different chords and how they fit together. In pairs or groups write your own song with lyrics to perform in front of the class. You have to write the song on the theme of "Sunshine"
You have to record the song on video. www.ukulelehunt.com is a comprehensive ukulele website that features chord charts and tabs for song arranged by genre and by difficulty. The strings in bold come on the beat, so overall the pattern is quavers, with the fourth string, plucked by the thumb, coming between every other note (which you can play with the finger(s) of your choice). The way to practise this is to get the 3-2-1-2 pattern going on the beat first, and then add in the fourth string in between each one. The second pattern is for music with 6/8 or 12/8 time signatures, and works particularly well for 12/8 ballads such as Can’t Help Falling In Love With You. 4 3 2 1 2 3 Again, the movement is in quavers, and the arpeggio pattern that you would expect is of course altered by the re-entrant character of the ukulele’s tuning. Use your thumb on the fourth string and your first three fingers on the others. This a tutorial strumming the song Can’t Help Falling In Love With You. Try the strumming or the finger picking with whatever you feel comfortable with. 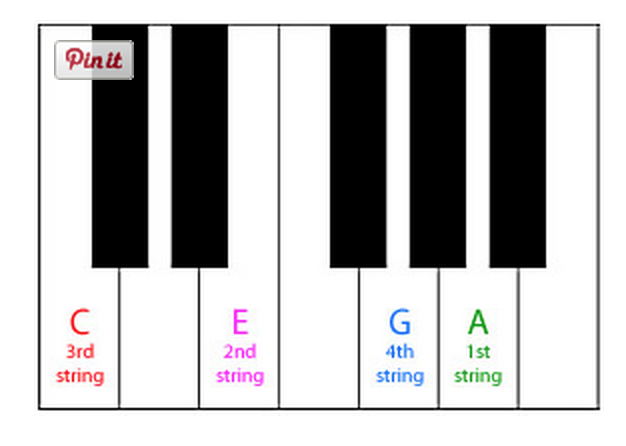 Learn these chords and explore these websites as a group. Look at the songs you would like to learn. Use websites like ukutabs to find the chords or video tutorials like this one. Work in pairs or in groups and you are expected to perform your son at the end of the lesson.